No-one likes getting their feet damp, but wet woodland has its place and is certainly valuable from the perspective of diversifying habitat. Wet woodland forms in low-lying, poorly-drained areas along riversides and streams, and in hollows and dells, on fens, and on higher, flat ground where the water table is high. It may be part of a larger woodland, or in clumps on fenland, or, on moor and heath, a separate feature as it follows the path of a stream. You will sometimes see wet woodland referred to as “carr”. The dominant tree species are willow, birch, and, particularly in northern regions, alder, while the ground flora is that usually associated with boggy land, such as sedges, reeds and flag irises, with brambles and dog rose on drier areas. 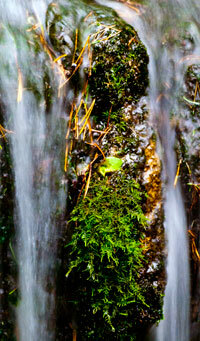 The damp atmosphere also favours liverworts and mosses. Its inaccessibility means that traditionally wet woodland has not been heavily managed – coppicing for basket-making and hurdles, some grazing. However, it is important as it stabilises riverbanks and gives cover to birds, otters and other water-associated animals. It increases the diversity of flora and fauna (biodiversity). Willow and alder support more varieties of insect than any other tree apart from oak, and the roots give shelter to fish. The abundance of insect life also provides food for fish. There has been a general loss of wet woodland in the last century through clearance and drainage, but its importance is now being recognised. Iceland’s missing woodland and forest.